Robert Schumann was a musician with literary ambitions. Though he'd eventually find lasting fame as a failed pianist and mad composer, it was the printed word that propelled his trajectory as a pugnacious defender of national interest in music. He studied law and philosophy at university and wrote poems and plays in the rosy Romantic style of his day. His poet heroes included the sickly and pious Novalis and Friedrich Hölderlin, who was as obsessed with ancient Greek divinities as Keats. In drama, it was Franco-republican sympathizer Heinrich von Kleist, whose theatrics culminated in a suicide pact with his incurably ill lover. In books, it was the satirical novelist Jean Paul Richter, who would eventually give the Davidsbündler their mythic names. The German Romantic movement that inspired him was a national cultural renaissance as important and significant as any of the developments to come out of England or France in the early 19th century, but it wasn't the product of a single country. The Germany of Schumann's birth in 1810 was a collection of independent puppet states loyal to Napoleon, either out of political expedience or military duress. After the Congress of Vienna redrew its map in 1815, the German Confederation remained a loose-knit alliance of northern Lutheran kingdoms and southern Papal bishoprics. But out of a shared mindset, it created a single nationalist brand of Romanticism guided partly by reason and newfound respect for individual rights; a little more by the medieval superstitions of the populace; and more still by deep-running sentiment for German unification. Its greatest flowering was in philosophical, literary and musical thought. While Georg Hegel mapped out his dialectical formula of human progress, Joseph von Schelling laid out a philosophy of the senses that inspired Englishmen like Wordsworth and Coleridge. While Karl Gauss expanded the tools of mathematics for later generations of scientists, Jacob and Wilhelm Grimm whetted the national appetite for mythical tales; Achim von Arnim and Clemens Brentano gathered material for Des Knaben Wunderhorn; and polymath Ernst Theodor Wilhelm (later Amadeus) Hoffmann split his time between music, botany and fantastic lore. While Beethoven was producing the cerebral works of his final period in total deafness, Carl Maria von Weber was busy linking music with patriotism for a hungry national audience. His opera Der Freischütz was first performed on June 18, 1821 (the anniversary of Waterloo) and was Germany's militant answer to the popular Italian-French tradition of Gioachino Rossini and Gaspare Spontini. Schumann had hoped to begin studies with Weber, but the composer's death in June, 1826 at age 39 deprived the young Saxon of a mentor and must have confirmed the perception that good Romantics die young. In 1834, Schumann co-founded the progressive journal Die Neue Zeitschrift für Musik with colleagues and fellow pianists Julius Knorr, Ludwig Schunke and Friedrich Wieck. Good Romantics the lot, they were on a mission from Apollo to promote intellectual seriousness in music and carry on Weber's quest to make war on the shallow and backwards influences of the day. High on their hit list were the villainous Rossini, salon music and the empty showmanship of virtuoso instrumentalists. Chopin, they admired as much for the national spirit in his music as for the imagination of his keyboard technique; Schumann had already written, in 1831, his famous rave over Poland's native son: "Hats off, gentlemen. A genius!" Liszt, on the other hand, was more of a borderline case. Schumann and his circle of friends wrote fiery and flowery essays under fanciful bylines, some taken from characters in Richter's stories. Schumann himself used the bipolar pen names of "Florestan" and "Eusebius," representing the stormy and gentle sides of his personality. 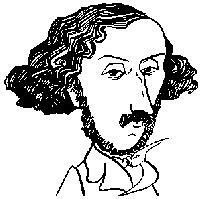 Felix Mendelssohn went by "Felix Meritis." Hungarian pianist Stephen Heller was "Jeanquirit." Schumann's pupil and future wife, Clara Wieck, wrote under the guises of "Chiara," "Chiarina" and "Zilia." The sobriquet "Meister Raro" has been attributed both to Friedrich Wieck (Clara's father) and to Robert Schumann, and it seems to borrow syllables from "Clara" and "Robert." Their loose society, of which Schumann was the moral leader, called itself the Davidsbund or "League of David" because its members saw themselves in the righteous role of the Biblical David fighting the banal Philistines of art and music. Collectively, they were Davidsbündler. To be fair, the ancient Philistines were probably no more evil than any other Bronze Age society and owed their tarnished reputation principally to having been vanquished by the Israelites, who got the privilege of writing the book on them. The new musical Davids fully intended to follow suit. In any case, the Davidsbündler long anticipated English literary critic Matthew Arnold's "coinage" of the term philistine as pertaining to enemies of art and culture. Schumann immortalized his associates in his piano fantasies Davidsbündlertänze, Op. 6, and Carnaval, Op. 9, in which he wrote descriptive character pieces portraying the individual Bündler as well as caricatures of celebrities of his time like Chopin and Paganini. If the Davidsbündler movement was influential, it was probably no more so than in anointing as its spiritual heir (or at least calling early attention to) Johannes Brahms, who in turn anointed Antonín Dvorák as his own heir. Ultimately, as happens with well-intentioned revolutions, their "progressive" movement would come to be associated with arch-conservativism. In her later years, Clara Schumann held Franz Liszt and Richard Wagner in open contempt. Brahms, her lifelong friend, was eventually cast as upholder of the classical tradition after Beethoven (the dead icon, not the living revolutionary). In their frontal assault on the hoary Philistines and later (after Schumann's death) their strategic defense against the Wagnerite progressives, the Davidsbündler tried to establish theirs as the dominant musical voice of the time by distinguishing themselves from the others. In retrospect, the distinctions look insignificant compared to what followed in the 20th-century, and ultimately the Romantic era was big enough to hold Beethoven, Schubert, Rossini, Schumann, Mendelssohn, Brahms, Liszt, Wagner, Verdi and Tchaikovsky. It may be that the Davidsbündler have left us a more pernicious legacy -- one that erects barriers, encourages closed minds and promotes internecine hostility or outright declarations of war between musicians. It's true there were musical rivalries and revolts before the 19th-century Davids hurled their first stones at the lumbering Goliaths of their day. Handel against Gluck. Rameau against Lully. Beethoven against everyone. But something was unleashed when the Neue Zeitschrift first went to press, and the venom hasn't stopped spilling. It continued in the ugly exchanges between the rival Brahms and Wagner camps and possibly in the riots that greeted new works early in the 20th-century. We may still hear its echo in the factionalism of neo-classicism versus serialism, serialism versus minimalism, uptownism versus downtownism or even in the posthumous, post-Soviet accusations flying around over Dissident Shostakovich versus Fireman Shostakovich. The Davidsbündler erected monuments to gods, created new myths out of old ones (Schumann wrote that Brahms came into the world like Minerva in full armor from Jupiter's brow) and declared a state of war in the music world. It's fun to write about musical warfare. There's drama without the nuisance of a body count. But that thinking neglects the longer perspective, that despite the rivalries and militating and segregation between musics, eventually they somehow dovetail to define the era they share and trace an arc of history and cultural evolution that makes benign sense to later generations. In music, "Make Love, Not War" isn't a bad motto. It's not obvious why pseudonyms were popular with the Davidsbündler or why they were only used for writing critical essays but not for writing music. Brahms (who did not write critiques) did publish some early musical works under the name of "G.W. Marks." The anti-Brahms, pro-Wagner music critic George Bernard Shaw wrote his scorchers with the whimsical byline "Corno di Bassetto." In contrary with respect to the Davidsbündler, the British composer and critic Philip Heseltine wrote criticism under his real name and applied colorful pen names to all his musical works. He was best known as "Peter Warlock" but also went by "Prosdocimus de Beldamandis, Junior" (after a medieval doctor of music and mathematics), "Rab Noolas" (that's "Saloon Bar" spelled backwards) and Huanebango Z. Palimpsest. It seems that people who use pen names share a sense of humor. In the case of Heseltine, his multiple identities have always fueled the Romantic notion that he had a schizophrenic disorder and that his suicide by gassing in 1930 was the murder of the gentle Heseltine by the spiteful Warlock side of his personality. Like Schumann, Heseltine suffered from depression (possibly from bipolar disorder). The rest is speculation. I began using a pen name in 1983 after my first professional article came out with my real name misspelled. I think I was attracted to an alternate identity for various reasons. Maybe it was because I grew up watching Clark Kent and Superman on TV as a kid. Maybe because I knew that almost nobody reads bylines and in any event, my readership wouldn't know the real me from Jack-in-the-Box. Or maybe because I could use a pen name to say something about myself, declare my intentions, tell a joke. My editor wouldn't let me use "Dr. Gradus ad Parnassum" because (a) I only had a Master's degree, not a PhD; and (b) it sounded too silly. So I hit on "David Bündler," and that's who I've been ever since. Contrary to first impression, it's not because I have any affinity for Schumann or his intentions. It just seemed like the perfect name for a music critic.